At the conclusion of the Conference of Presidents of Parliaments of the European Union held in Tallinn, Estonia, the Speaker of the Parliament of Albania, Gramoz Ruçi, accompanied by the Chairman of the Parliamentary Group of the Socialist Party Taulant Balla, held a meeting with the Speaker of the Parliament of Serbia Maja Gojković. 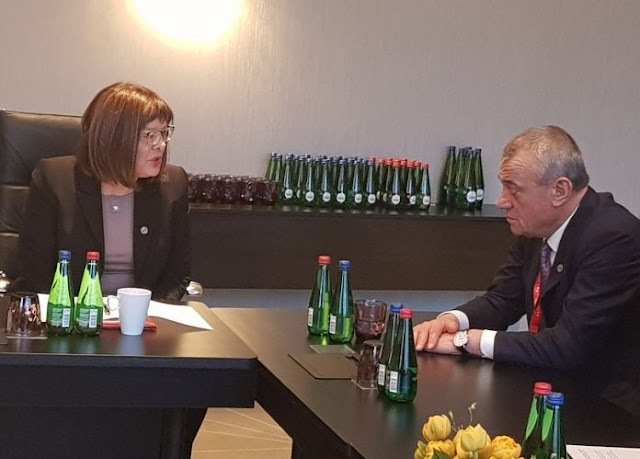 During the meeting with Gojković were evaluated the steps undertaken in recent years between the two countries for the intensifying political-economic-trade relations. Ruçi expressed during the meeting that the Regional Cooperation towards European Integration is a positive transformation process for all countries. "The unconditional positive recommendation for the opening of accession negotiations with the European Union for Albania and Macedonia and the intensified talks with Montenegro and Serbia are a recognition of the merits of these countries in the area of difficult battles for strengthening the rule of law, fighting crime and corruption. The Enlargement Strategy for the Western Balkans has been a transformation process for it. Today, this is a region devoted entirely to the European project." said the Speaker of Parliament. Points of discussion during the meeting were the issues of Kosovo-Serbia dialogue as well as the rights of Albanians of the Presheva Valley. Regarding the dialogue, the Speaker of the Albanian Parliament expressed the determination that Albania supports strongly the Kosovo-Serbia dialogue led by the European Union which will enable the joint solutions on some important issues for the benefit of citizens of both countries. As for Albanians in the Presevo Valley, Ruci said that the Albanian government sees with great interest the situation of Albanians living in South Serbia in order to enable them full rights such as the inclusion in the socio-economic life of the country. "We expect greater attention from the Serbian government to equipping the Presevo Valley students with texts of Albanian language which is a legal and constitutional obligation, but also an obligation deriving from international conventions part of which is Serbia. We are ready at any moment to contribute to finding a quick solution to this issue through the development of expert level meetings between the two Ministries of Educations." Ruçi said.